Arianespace have launched their Ariane 5 ECA on another mission, again to loft two satellites into orbit – namely ASTRA 2F and GSAT 10 – from the European Spaceport in Kourou, French Guiana. The launch was on schedule at 21:18 UTC on Friday evening, with the workhorse successfully sending its two passengers to GTO. This flight was designated Flight VA209 in Arianespace’s numbering system, representing the 209th mission of an Ariane family launcher since the maiden liftoff of an Ariane 1 version in 1979. The success is the 51st in a row for the Ariane 5. The payload lift performance for Arianespace’s latest Ariane 5 mission was more than 10,200 kg., which includes some 9,400 kg. for its two satellite passengers – ASTRA 2F and GSAT-10 – along with the launcher’s dual-payload dispenser system and satellite integration hardware. 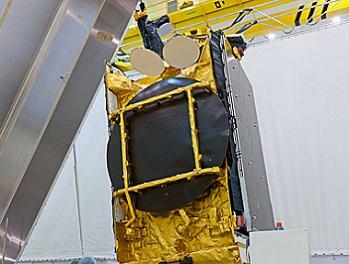 The mission’s Astra 2F passenger was produced by the Astrium division of EADS for satellite operator SES, and is configured with Ku- and Ka-band transponders to enable the delivery of next-generation broadcast, VSAT and broadband services in Europe, Middle East and Africa. This powerful six metric ton-class relay platform utilizes Astrium’s Eurostar E3000 satellite bus and carries Ku- and Ka-band payloads for the delivery of high performance Direct-to-Home (DTH) and next-generation broadband services. It will be deployed first during the 30-minute flight sequence. Its planned orbital location at 28.2 degrees East is one of SES’ prime positions that serves such premium broadcasters as BSkyB, the BBC, ITV and Channel 5. From this geostationary slot, SES delivers programming to almost 13 million satellite homes and over three million cable homes, as well as 700,000 Internet Protocol television (IPTV) homes in the U.K. and Ireland. Additionally, 28.2 degrees East is used by SES to broadcast numerous channels for the growing DTH platforms in sub-Saharan Africa. Also orbited by Ariane 5 was the Indian Space Research Organisation’s GSAT-10, which carries Ku- and C-band transponders for relay services, as well as the GAGAN (GPS and GEO augmented navigation) payload. Configured with 12 Ku-band, 12 C-band and 12 extended C-band transponders, GSAT-10 utilizes the I-3K satellite bus developed by ISRO, with a power capability of some six kilowatts and a liftoff mass estimated at 3,400 kg. Also included on GSAT-10 is the GAGAN (GPS and GEO augmented navigation) payload, which will support the Indian government’s implementation of a satellite-based regional capability to assist aircraft navigation over Indian airspace and in adjoining areas. 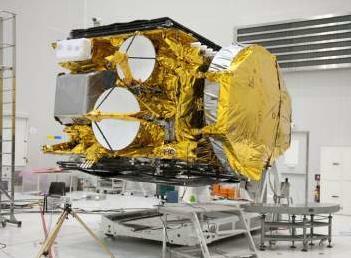 The initial GAGAN payload was carried aboard the GSAT-8 spacecraft, orbited by Arianespace on an Ariane 5 mission in May 2011. Arianespace’s September 28 mission continues a busy year of activity for the workhorse Ariane 5. Previous launches conducted in 2012 include the March delivery of Europe’s third Automated Transfer Vehicle for servicing of the International Space Station – which is set to undock shortly after Friday’s launch – along with dual-payload missions that orbited JCSAT-13 & VINASAT-2 (May), EchoStar XVII & MSG-3 (July) and Intelsat 20 & HYLAS 2 (August).